The seventh day of Comparte en el Caracol II de Oventic began promptly at 10 am, in the middle of a blistering sun, unusual for the Chiapas Highlands, and with the presence of members of Zapatista support communities and domestic and international volunteers. People from the Tzotzil, Zoque and Tzeltal indigenous communities, dawning ski masks, bandanas (some without) presented a diverse repertoire of art: poetry, music, dance, and theatric songs. Various well-formed groups of performers showed us the history of the indigenous people, from the oppression and resistance following the arrival of the Spanish to the counterinsurgency strategies that the people of southeastern Mexico are fighting in their struggle for liberation. The following 18 images show the evolution of the Festival por la Humanidad en el Comparte del Caracol de Oventic (CompArte Festival for Humanity held at the Oventik Caracol (Zapatista Autonomous Government Center). The festival, organized by the Zapatistas in their autonomous territory, began promptly at 10 in the morning. The human heat and blazing sun draped those that arrived at first hour to enjoy the artistic works of the Zapatistas. At the entrance of Caracol de Oventik, those that arrived where invited to self-reflect on “the art of solidarity” – with a sign that asked if they had already visited the teachers, a reference to the blockades and encampments of teachers who have been protesting the Mexican neoliberal education reform. Between the sun and mist, thousands of members of the zapatista bases of support from the region of the highlands Chiapas, assembled at the Caracol II to both observe and share their art with the people present from both the national and international civil society. The stage, built on top of the basketball court and covered with a tin roof, was fenced off to ensure all activities ran smoothly, as hundreds of men and women of the Zapatista combatants held firm for 10 hours, interrupted only by a light rain. Many men, women, and young people acted out dozens of plays over the course of the nine-hour-long program. Entire theater companies performed the stories of the conditions that led to the Zapatista uprising; stories they have now been telling little by little in the last 20 years of struggle. The harvest dance took place in the middle of the fog. With this act, they showed us how to harvest cornfields and the importance of collective work for the resistance. The Zapatista discipline and effort was apparent; dances were very well executed, plays, poems and songs were performed masterfully, and the audio and sound were superb. The attendees showed enthusiasm for the diversity of the indigenous participants, made up of Tzeltal, Tzotzil, and Zoque communities from the Chiapas Highlands. Men, women and children focused their gaze on stage, where the lives of their grandparents in the time of farms and ranches were portrayed. The performances included the history of indigenous peoples starting with their oppression and historical resistance since the arrival of the Spanish, to the counterinsurgency strategies that the people of southeastern Mexico are fighting in their struggle for liberation. Many artistic performances were part of the CompArte in the Oventic Caracol (Zapatista autonomous government center), including poetry, songs, dances and dance music, paintings, music, and various plays performed by the various Zapatista regions. In the faces of the festival attendees there was joy and hope. Many words and smiles were shared by all during the course of the day. 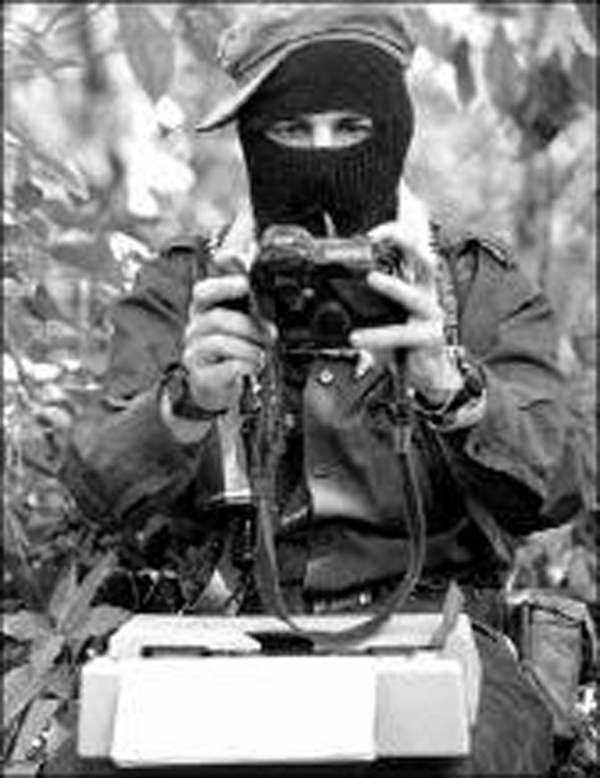 The Tercios Compas [Zapatista Media] set up their media teams to document the activities with video, audio and pictures to “share with the people and the leadership”. The young Zapatistas ska dance performance of the “Worker’s Waltz” produced elation in the crowd, and the audience’s ovation generated energy and resistance among attendees. The “Bolonchón” dance was performed by members of the autonomous municipality of Magdalena de la Paz, from the Vicente Guerrero region. Los Originales de San Andrés closed out the event for artists and festival goers alike. Zapatista corridos played over the sound system as we said goodbye and walked down towards San Cristobal de las Casas. Gradually the Zapatista artists picked up their instruments and tools, and in between reciting rhymes and poems they slowly walked away from the main stage that housed their art for the day on July 29 in Oventic.